On Homeline, Abraham Lincoln once famously remarked that while he hoped to have God on his side, he had to have Kentucky. On this world, the free-soil States had both it and Tennessee all along – and thus the American Civil War was strangled in its cradle. What took its place was what seems to be an endless series of little wars in what was once Mexico, with the United States always ready to take advantage of one group or another’s failure to rule over what they have conquered. Centrum encourages the expanded Manifest Destiny of America, while Infinity takes notes. 1784: American Congress votes to ban slavery in the territories, which eventually causes an internal power shift in the USA. In 1784, the American Congress (still operating under the Articles of Confederation) had for its consideration a measure that would have banned slavery in the western territories – effectively restricting it to Maryland, Delaware, Virginia, the Carolinas, and Georgia. On Homeline, it failed passage by one vote: a critical delegate (John Beatty) from New Jersey was sick that day. On Filibuster, Beatty was still sick – but he had also broken his leg six months previously, thus requiring a temporary replacement for his state’s Congressional delegation. That delegate duly voted for the measure. The Ordinance of 1784 that this was part of was never actually implemented, but the ban was still enough to cause both Kentucky and Tennessee to enter the Union as free states in 1792 and 1796, respectively. However, the invention of the cotton gin in 1809 made the status of the remaining US territories more relevant: Louisiana, Mississippi and Alabama were all admitted as slave states, Congressional ordinances or no. In 1819, the Missouri Crisis occurred over whether Missouri (and, by extension, the rest of the Plains region) would permit slavery. Attempts at a compromise failed when negotiations between Speaker of the House Henry Clay and Representative John Calhoun broke down; the former was in the end unwilling to allow the South any more of a check on the nation’s development than it already had. The dispute culminated in an abortive rebellion in South Carolina; when it spluttered out, so did the notion that individual states could dictate to the Federal Union as a whole. None of this directly affected the breakup of the Spanish Empire’s American possessions, but the civil unrest that resulted outside of the USA was duly noted by those unhappy with the results of the Carolina Rebellion. American interest in land technically controlled by Mexico was already high: the Rebellion merely encouraged interest in private military expeditions to acquire new territories. It is not surprising that the Federal government encouraged them to go, especially since it was able to painlessly annex their new nations later. 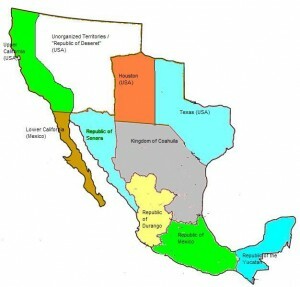 Texas in 1835, Upper California in 1838, Cuba in 1848… currently, the USA is in the process of negotiating for the admission of Lower California, William Walker’s Republic of the Yucatan and the “State of Deseret.” The American government also expects to be at war with the Republics of Sonora and Durango and the Kingdom of Coahuila within the next two years, thanks to those three filibuster states’ continuing exploitation of what remains of Mexico – which is itself interested in joining the United States, if only to maintain some territorial integrity. Slavery, while still technically legal in some states, has been steadily decreasing in frequency; acceptance of the former slaves has been taking longer. The upcoming election promises to be heated: the Democrats are almost certain to nominate Governor Stephen Douglass, but President Winfield Scott’s Whigs do not have a clear front-runner, as their party is split between Senator Abraham Lincoln’s expansionists and Vice President Millard Fillmore’s nativists. The rest of the planet remains more or less identical to Homeline’s, although the South American nations have been attempting to get better relations with the British Empire in this timeline. Up to about seven years ago, they seemed to be succeeding. England’s abrupt warming towards the USA is probably the best indication of how much control Centrum already has over Filibuster. When Infinity discovered Filibuster two years ago, Centrum had already been infiltrating both the USA and the British Empire for about five years. Interworld seems to be concentrating on keeping the two countries from going to war with each other while they expand, with a long-term secondary project of encouraging various egalitarian movements. Infinity isn’t certain whether Centrum’s long term plan is a British / American co-dominium, or something else; they aren’t even sure which philosophical faction is running things. The I-Cops are generally tasked with… doing nothing particularly active, actually. The timeline is not an echo, Centran control seems to be too strong to break without more resources than Infinity can readily spare, the local Interworld group seems uninterested in interfering with Infinity merely observing, and even if the timeline was open to exploitation there would be little in Filibuster to uniquely appeal to regular tourists, or even expatriates. So Infinity’s small staff there merely practices trying to keep track of Centran machinations.